Healthcare is the second fastest growing sector after government in terms of IT spending. Saudi Arabia’s healthcare IT market is forecast to rise by 11 per cent annually and is one of the fastest growing markets in the world, according to a report by International Data Corporation (IDC). IT spending in Saudi Arabia is due to modernisation and expansion of hospitals and clinics as the country looks to increase its bed capacity to 30,000. As per the report, spending on IT among healthcare organisations in the UAE, Saudi Arabia, Turkey and South Africa is expected to rise over the next five years and is forecast to jump by 10 per cent annually. “Governments in the four markets have all made great efforts and a real commitment to improving the quality of health services and the patient experience,” says Nino Giguashvili, senior research analyst for IDC Health Insights. According to the IDC report, healthcare is also the second fastest growing sector after government in terms of IT spending. The report also predicts that IT support services will be the fastest growing service areas in the four markets. E-health has become a top priority among GCC governments in the last few years with some even adopting smart applications in healthcare. 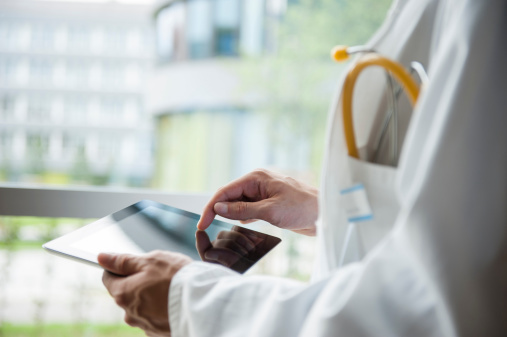 Last year, Dubai Health Authority (DHA) announced the distribution of around 3,000 tablets across its hospitals and primary health care centres as a part of the emirate’s smart government initiative. “The deployment of android tablets across DHA healthcare entities is the first step in our plan to build ‘smart hospitals’ that will be integrated with the latest IT technology to enhance customer experience,” said Essa Al Maidoor, director-general of the DHA. The tablets will allow patients to look up all the services offered by the DHA along with pharmacy, physiotherapy and rehabilitation services, he said. Al Maidoor said that the IT roadmap also includes an electronic medical records system and health information system and will take around two to three years to be completely implemented. DHA has been working on improving its digital presence, and in the last quarter of 2011, the authority developed several smartphone applications for customer use.